For most people it is time to indulge in various traditional holiday activities...or create new ones! If you are looking for some local holiday events, check out this week's calendar as we have included some select holiday events for fun for your information. calendar for January 19, 2019, follow this newsletter, and visit our website for the most up to date information. Mark your calendars for our annual IBC Fundraiser. It will be held on Saturday, January 19 at the 21c Museum Hotel in Bentonville. to access the link for ticket sales. Read on below for more information and bios of our winners. This year's solo/duo winner for the second year in a row, was Tony Redman. Tony shook the rafters at his venue in Memphis at the 2018 IBC and we look for him to give the 2019 IBC crowd a strong dose of his unique heartfelt blues. 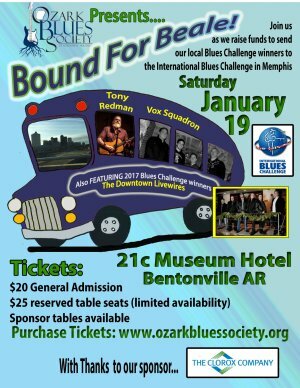 Tony Redman Bio: " Tony Redman is a blues guitarist/vocalist, living in Fayetteville Arkansas. 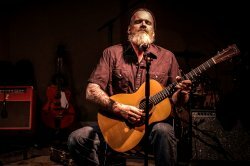 Redman’s repertoire contains a mix of originals, and classic songs steeped heavily in delta blues. With a high energy live set, Tony Redman has proven to be one of the most expressive vocalists, and powerful slide guitarists in the blues scene today!" Our band winner this year is Vox Squadron from Tahlequah, OK. This band competed in our 2016 Blues Challenge and returned this year for another try....for them, the second time was the charm. 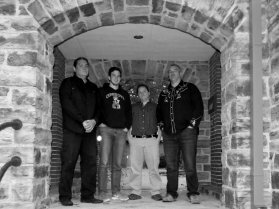 They will take their heavy hitting rock oriented blues to Memphis for the 2019 International Blues Challenge in January. Jimi Hendrix and Ian Moore. Richard and Aaron are multi-instrumentalists in several bands in their locale. Jacob is a jazz scholar at Northeastern State University." Please enjoy the following listings comprised of bands, venues, and/or organizations that support Ozark Blues Society. Always check with individual venues for event details and schedule changes. Thanks to the following for their support of blues education. Annual membership levels begin at $15 and give you so much in return, including meeting new friends while enjoying the best blues artists in the area. By being a member of The Ozark Blues Society of Northwest Arkansas, you are helping to support the Arts and to preserve the Original American Art Form known as The Blues.